Nearly forty department members—about half clinical and half basic researchers, plus administrators and staff—completed attended the 2016 Research Retreat. A daylong Research Retreat on April 29th helped identify key research themes in which the department should invest in order to take Emory Radiology and Imaging Sciences to the next level of excellence and achievement. After a brief welcome, department leaders identified the day’s goals and reviewed a previously conducted SWOT analysis. Nearly forty department members—about half clinical and half basic researchers, plus administrators and staff—completed a fun ice breaker and then got to work. • Perception and Training (Elizabeth Krupinski, PhD & Bill Auffermann, MD, PhD). Presenters gave attendees ideas about what is “hot” in the field today, and where the department already has investments, interest, expertise, and even potential for new collaboration. The presentations generated considerable discussion among attendees, a number of whom participated online. The afternoon then drew everyone into collective brainstorming about the future direction for the Emory Radiology research enterprise. 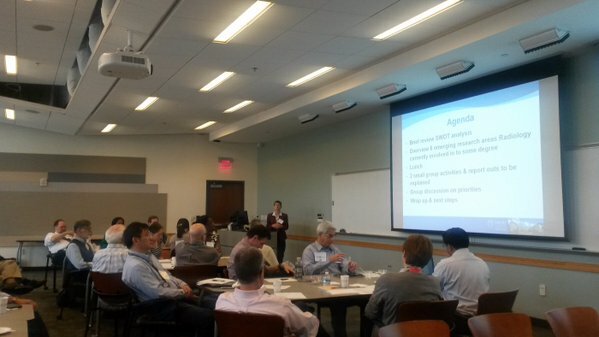 Small group activities challenged attendees to a) narrow down topics to a few key emerging scientific themes; b) define the guiding factors behind identification of the themes, and c) identify opportunities to collaborate with other departments and institutions. After two rounds of deliberation, two research themes emerged as areas that capitalize on departmental strengths and support the overall missions of the department, the School of Medicine, and Emory: image-guided assessment, treatment and monitoring; and quantitative imaging, particularly with respect to cancer. Interesting imaging application areas included pediatric neuroimaging, sports medicine, infectious disease, and Alzheimer’s. Participants emphasized the need for more pediatric imaging projects. A number of foundational sub-themes were identified as essential to address in pursuit of achieving excellence in the main research areas, especially to support existing research efforts. They included technology assessment, deep learning/informatics, decision support, value-added imaging assessment, and systems-based imaging. Opportunities identified for collaborative hiring and project development involved established partners: Children’s Healthcare of Atlanta, the Brain Health Initiative, Winship Cancer Institute, Georgia Tech, Rollins School of Public Health, and other clinical and basic science departments at Emory. Opportunities to capitalize on newer partnerships related to bioinformatics, robotics, health policy, and economy. The growing need for collaboration with industry was noted throughout the day. Over the next few months, the executive leadership team will formulate plans to develop the optimal infrastructure and attract the resources necessary for integrating these exciting new directions into the department’s already outstanding research portfolio, and to better position the department for success in the challenging funding and policy environment affecting both healthcare research and clinical practice.